3. Playing or Written Quizzes/Tests – Students will periodically complete written or playing tests. 20 points for playing test, 25 for written exam. 4. Extra Credit- Any student who attends an instrumental music event or performs outside of school throughout the year can receive 10 extra credit points per each event. Students must bring in concert program with a parent/director signature to receive credit. 5. Performances – All band students will perform in all required performances. 50 points each performance (minus 10 for improper dress, minus 10 for being late, minus 10 for no music, minus 20 for no instrument). 1. Students shall respect the teacher, other classmates, their instruments, and band room equipment at all times. Students shall not play/touch instruments and band room equipment that are not their own without permission from the director. Instruments/materials shall be stored in a safe and proper location each day. 2. Students must arrive to rehearsal 4 minutes after their previous class has let out. Thereafter, they will have 2 minutes to get out instruments/materials and begin warming up in their seat. Failure to do either of these will result in warnings the first two times, followed by a detention/sentences (to be served during school hours). 3. Band supplies are available for purchase before/after school, during recess, and during lessons. The ‘band shop’ is not open during rehearsals. 4. Students must follow directions the first time they are given. · Attendance at all performances are required and is part of your grade. · A calendar of the band activities for the year is available by the start of the school year. Please mark these on your calendar to avoid any scheduling conflict. We will notify you as soon as possible of any changes to the calendar. · Conflicts with outside activities will result in the loss of the performance grade. Personal or family emergencies are excused with a written note/phone call from the parent explaining the nature of the emergency. In this instance, students must complete a make up assignment to earn performance points. · Courses are one year in length—students may not drop at semester (extenuating circumstances must be approved by principal and director). · Students may join at the beginning of the school year. Students may join at semester only with principal and director permission. · Students who wish to switch instruments must take a minimum of 3 months private lessons before joining. · Students who repeatedly do not participate or show respectful rehearsal techniques will be asked to drop the course (principal/director decision). Intermediate Band — 6th grade students who have been playing for one year on their instrument or have taken private lessons. The band room will be open at 7:40 a.m. and after school until 3:30pm. 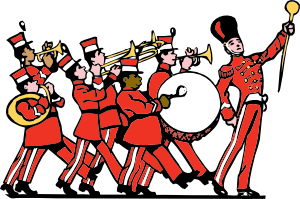 · No students are allowed in the band room without the presence of a director or other staff member. · Band class rules apply to all students using the band room. · No food, drink, or gum in the band room please. · No running or horseplay in the band room. Students who rent a school owned instrument will be charged a maintenance fee ($40) for the use of the instrument for the year. In addition, parents will be asked to sign a contract including the condition of the instrument. Any damage to the instrument that is considered beyond normal wear and tear will have to be repaired by the student. The Band Director will determine what is considered excessive wear and tear. The director has the right to refuse rental to any student who has a history of excessive damage to horns. That student then has the option of renting or purchasing a horn from one of the local music companies.